Among the front-wheel-drive C-HR's long list of standard features is a safety package that includes a pre-collision system with pedestrian detection, lane-departure alert with steering assist, and full-range radar cruise control. Toyota’s new C-HR crossover will start at $24,690, plus destination charges, in Canada and go on sale May 1 as a 2018 model., the company said Thursday. The boldly styled C-HR was first revealed as a Scion at the 2015 Los Angeles Auto Show. Toyota is mostly using the “mono-spec” pricing and equipment formula that the defunct Scion brand employed to get young drivers into well-equipped vehicles at relatively low prices. That starting price is for the XLE trim, in Toyota nomenclature, with an XLE Premium grade coming in at $26,290, plus shipping. The automaker didn't immediately say how much its destination charge is. Toyota’s lower trim levels such as L and LE won’t make it onto the C-HR for now. There are also no high-end options such as leather seats, four-wheel drive, premium infotainment or even a sunroof. All C-HRs are equipped with a four-cylinder engine with 144 hp and a continuously variable automatic transmission. Toyota said both trims have a receive fuel efficiency rating of just 8.7 L/100km in the city, 7.5 L/100km on the highway and 8.2 L/100km combined. 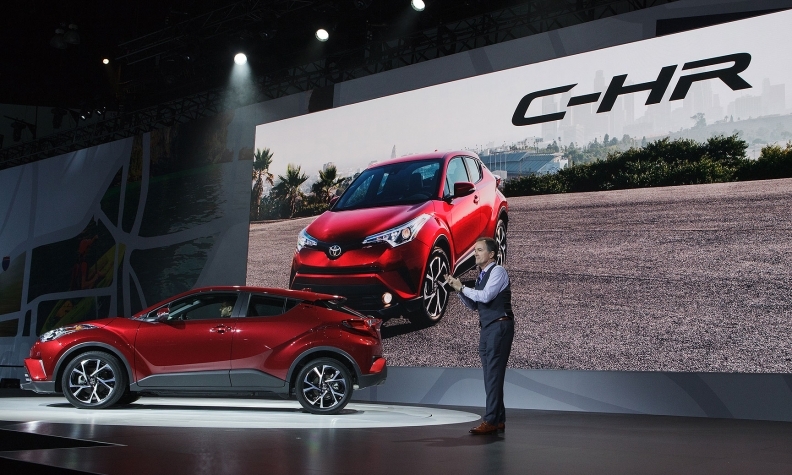 Bill Fay, general manager of the Toyota division, said the automaker wanted to keep the youthful spirit of Scion in the C-HR in terms of looks, price and value. The C-HR arrives at Toyota dealerships as demand for small crossovers continues to grow. C-HR competitors include the Nissan Juke, the Mazda CX-3 and the Honda HR-V.
Laurence Iliff and Greg Layson contributed to this report.